And because it was so beautiful, it set me longing, always longing . . .
“Mommy, I love beautiful things.” Eden watches wide-eyed out the car window, breathless with her view. Driving, I glance around to see what she sees. Brown, brittle grass. Snow remnants lining the highway. Empty train tracks alongside billboards telling us we are nearing the Castle Rock outlet mall. We are on our way to Children’s Hospital in Denver, an hour’s drive from home, for another appointment. 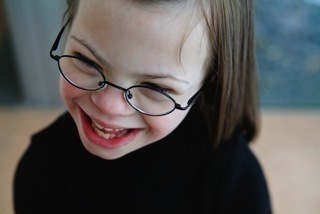 A routine appointment, except nothing is routine with Down syndrome. An eye check-up can lead to surgery and a summer of recuperation. A cardiologist follow-up can lead to an outpatient procedure that leads to infection and two rounds of antibiotics. A “well child” visit is a misnomer because everyone, from the receptionist to the pediatrician to me with my overflowing medical history binder, knows Eden will never be “well.” At least not according to the charts. Not according to what counts. I lean over and kiss her hair. She leans in, as always. I sympathize with the mom because my kids ask the same kind of question about people who look different. It’s true that Eden’s face is not like yours or mine: it tells everything. When she walks into a room, people know things about her, about her needs and failings. But lost expectations are my story, not hers. Her face is not “wrong,” any more than yours or mine is. It is true and beautiful, it is what I long to be. It is a glimpse of God. The first time I saw Eden’s face eight years ago, I didn’t recognize it. It was on an ultrasound screen, six days before she was born. My husband and the ultrasound technician exclaimed over it, pleased with its clarity. Even though I could see nothing but black craters, I nodded and smiled. What mother doesn’t know the face of her baby? Later, I walked by the printout on the dining room table and I saw it. The face was not the white smudge or dull swirl in the corner. It was the whole image. Her eyes squinting, her mouth open. I could not see it before because I was searching only fragments of the picture. I had read that if a baby continued to grow at the rate she did immediately after conception, she would be bigger than the sun by the time she was born. I understood this when I saw that unmet face, creviced and gray, filling all that paper, all of me. How patiently she slowed herself to earth. We looked at each other. She was, as I was, in the slim, sharp hours of waiting to be born. Those were the days when we wanted a healthy baby and God wanted us to be like Jesus. God could see what still hid from us, those bones and skin and tender eyes, yet no angel came to whisper heaven’s secrets. Many people knew, in fact, before I did, and only their prayers keep me from holding this against them. An hour after Eden was born, my husband and the pediatrician and our pastor were at the foot of my bed, fresh from the intensive care unit where Baby Girl Stanford was breathing. They hesitated — leukemia? death? I wondered — before telling me that my daughter had Down syndrome. Every question, answer, grief came in that sentence, and I have been untangling each part since, taking it out to examine, putting it back to exchange for another. The first time I held her, I tried to believe that I was the mother of this child who looked as if she had Down syndrome. Her face, that lifelong expectation, became a wound for a time. A reminder of my failings. When her mouth twisted into an accidental newborn smile, it shocked me. Later I would want to inhale that face, feel the bulge of her cheek as she laughed, smother with kisses the vulnerable downy side of her head. But in hospital days I looked at her face in my arms, and then my face in the bathroom mirror, and I saw a sadness in my eyes that I never wanted to know. It was the beginning of understanding that I’d created my child in my own image, but that was too small. Eden, like each of us, is too grand for anything but the image of God. Before Eden was born, she was vibrant, a gust of life far from ending. But since those first frozen hours of birth, she totters on life and death as we all do, and summer or morning is no longer promised. At times in the early months I had trouble seeing Eden as growing, hopeful, living at all. Too much was incomplete about her. Medical specialists told us what was missing in her brain, her heart, her muscles. They gave us suggestions of how to fix her. Or not. Her face was a battleground for my emotions as I struggled to feel like a “normal” mom. I remember holding Eden as an infant while I talked with a friend about whether there will be Down syndrome in heaven. My friend said there will be — a way of encouraging me that Eden was just right as she was. As a new mother dealing with open-heart surgery, seizures, and the threat of a variety of cancers, I could not believe this was true. One extra chromosome means the body does not work right. A stick in the bicycle spokes. An eventual crash. But I appreciated what my friend was trying to say: What is weakness on earth will not be weakness in heaven. What is “well” or “abnormal” on earth will have different names in heaven. Throw out the growth charts. Burn the five-year check-up acuity scale. Forget about standardized testing. Because the truth is, you and I and Eden are all incomplete. We were made for a world beyond blood work and teasing and life expectancies. We were made for perfection. Perhaps the beauty in Eden’s face is that she knows this. She radiates joy not in spite of what is “not right” about life but because of it. Because every loss we experience points us to the time when loss will be no more. Because life itself is more right than we realize. Too much to pin on an eight-year-old, I know. And I wince when people refer to children with Down syndrome as “angels” who are “always happy.” Anyone who watches us try to get Eden out the door to school in the morning knows that is not true. But I do wonder if it is Eden’s weaknesses that allow her to love more fully, to find the joy that comes from that richer love. It is her unabashed incompleteness that draws people to her, even as she overflows with the fullness of who she is. “I like being inside my life, Mommy!” she told me once on the way to the park. “I like the way I walk! I’m a great walker!” Isn’t this closer to God than my words of discouragement and insecurity? Isn’t this an acknowledgment of beauty that is always there, ready to be plucked and savored? She does see more than I do. So let me tell you what is beautiful: my daughter walking in from recess with two friends, their arms flung around each other’s shoulders. Eden running to the front of the church with a dozen girls in twirly dresses to dance during the last song of the service. Her squeals of delight as she eats a hot fudge sundae at Dairy Queen. I can look at each of these things and point to their flaws, their embarrassments, the desires they do not meet. But when I reach to a richer reality, I know they are beautiful. Let me tell you more beautiful things: a fifth grader holding Eden’s coat for her after school so she can get her arm through the sleeve. A daddy reading Black Beauty aloud during tedious breakfasts of spoon-feeding yogurt. A young neighbor pushing Eden on the swing and smiling, shyly, when Eden shouts, “I love you!” on her way up. Each of these things shows joy, and none would be possible without weakness. Could it be weakness, after all, that exposes love? Is this why the worldly “weakness” of Eden’s face points me to the strength of a loving God? One day you and I will understand that what is weakness on earth is not weakness in heaven. That the strength we pray for may not be what we need. And that God shines through the most broken parts of our lives when they cause us to give and receive love — as if that’s the beauty God treasures most. How silently, how silently I came to find beauty in Eden’s face. Now when I creep in to check on her at night, I watch her expression in shadows and hints of light. I stare at her mouth, twitching, smiling, grumpy in her sleep, that exquisite forehead rippled and easing in front of me. I realize the fullness of her breath, her broken heart still beating, and I feel the warmth of her body near me. A beetle, a seed burst, a rabbit’s eye. Nothing has ever been more alive. “Mommy, you know what?” Eden calls from the back seat on the way home from Denver. “What?” I turn down the music. “God loves you, Mommy!” Eden laughs and swings her legs, giddy with truth. “Oh yeah, Mommy. I already know that.” She goes back to reading. I see her face framed in the rearview mirror. I see my eyes watching her. I am tired, eager to get home, feeling the familiar need to be alone after a long appointment. It is rush hour, and we still have homework and dinner and bath ahead of us. The setting sun is too bright in my eyes. I realize I am in between again, mulling over the appointment and thinking toward the rest of the week. I try to stop and enjoy her voice, her giggles, even her feet kicking the driver’s seat as we slow to a stoplight. And for a moment I pray to know what she knows, to see what she sees. To see, perhaps, the face of God. All photographs by Lisa Beth Anderson. Elisa Fryling Stanford is a writer and editor living in Colorado. She is the author of Ordinary Losses: Naming the Graces That Shape Us. Elisa and her husband, Eric, have two daughters.